Have you ever considered what makes an anti-malware application effective? We at Malwarebytes have created an easy-to-use, simple, and effective anti-malware application. Whether you know it or not your computer is always at risk of becoming infected with viruses, worms, trojans, rootkits, dialers, spyware, and malware that are constantly evolving and becoming harder to detect and remove. Only the most sophisticated anti-malware techniques can detect and remove these malicious programs from your computer. Malwarebytes' Anti-Malware is considered to be the next step in the detection and removal of malware. In our product we have compiled a number of new technologies that are designed to quickly detect, destroy, and prevent malware. Malwarebytes' Anti-Malware can detect and remove malware that even the most well known anti-virus and anti-malware applications fail to detect. Malwarebytes' Anti-Malware monitors every process and stops malicious processes before they even start. The realtime protection module uses our advanced heuristic scanning technology which monitors your system to keep it safe and secure. In addition, we have implemented a threats center which will allow you to keep up to date with the latest malware threats. Activating the full version unlocks realtime protection, scheduled scanning, and scheduled updating. For consumers and personal use, it is a one time fee of $24.95. For corporate and business customers, annual licenses are required, please see our Corporate Licensing program. Support for Windows 2000, XP, Vista, and 7 (32-bit and 64-bit). Ignore list for both the scanner and Protection Module. Settings to enhance your Malwarebytes' Anti-Malware performance. 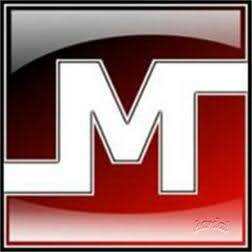 Simply download Malwarebytes' Anti-Malware from the one of the links below. Double click the downloaded file to install the application on your computer. 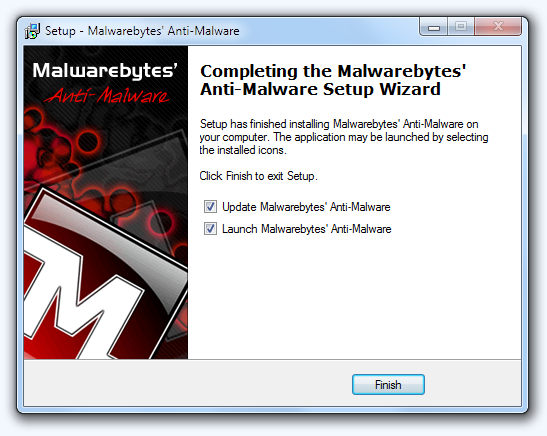 Once the application is installed, double click on the Malwarebytes' Anti-Malware icon to start the program. When the application is open, select Scan and the application will guide you through the remaining steps. Fixed issue with the scheduler not performing realtime updates. Fixed multiple issues with product crashing during a scan. Fixed issue with log not saving on certain command line scans. Fixed various issues with Finnish, Italian, and Norwegian languages. Fixed formatting and misspelling issues in product help file. Operating Systems: Microsoft ® Windows 2000, XP, Vista, 7. Languages Available: English, Arabic, Belarusian, Bosnian, Bulgarian, Catalan, Chinese Simplified, Chinese Traditional, Croatian, Czech, Danish, Dutch, Estonian, Finnish, French, German, Greek, Hebrew, Hungarian, Italian, Korean, Latvian, Lithuanian, Macedonian, Norwegian, Polish, Portuguese, Romanian, Russian, Serbian, Slovak, Slovenian, Spanish, Swedish, Turkish. 1. Please download this official version of Malwarebytes' Anti-Malware. 2. Install Malwarebytes' Anti-Malware by double clicking on mbam-setup. 3. Follow the prompts. Make sure that Update Malwarebytes' Anti-Malware and Launch Malwarebytes' Anti-Malware are checked. Then click finish. 4. Malwarebytes' Anti-Malware will automatically update itself after the installation, click the OK button to close that box and you will now be at the main program Window as shown below. If you are having problems with the updater, you can use this link to manually update Malwarebytes' Anti-Malware with the latest database. Make sure that Malwarebytes' Anti-Malware is closed before installing the update. 5. Close All opened Windows, Programs, File or Folders. 6. Make sure you are on the Scanner tab. Select Perform quick scan then click the Scan button as shown below. 7. Malwarebytes' Anti-Malware will now start scanning your computer for infected files as shown below. 8. When the scan is finished a message box will appear, click OK to continue. 10. You will now be presented with a screen showing you the malware infections like shown below. Yours may look different depending on the infection you have. 11. Click on Remove selected. 12. When removing the files, Malwarebytes' Anti-Malware may require you to restart the computer in order to do a complete removal. If it displays a message stating that it needs to restart, click Yes. 13. After that you can close the Malwarebytes' Anti-Malware window, your computer is now cleaned from the malware infection. To protect and prevent your computer from experiencing future threats like this, we highly recommend purchasing the FULL version of Malwarebytes' Anti-Malware with real-time (live) protection . Malwarebytes is really effective security software. Thanks for sharing the article. I believe what you typed was very reasonable. maybe grab folk's attention? I mean "Malwarebytes Anti-Malware | Malwarebytes download |Malwarebytes free download |Malwarebytes free download Key Features| Malwarebytes Usage |" is kinda plain. You ought to peek at Yahoo's home page and see how they create post headlines to grab viewers interested. Amazing .. I'll bookmark your site and take the feeds additionally?